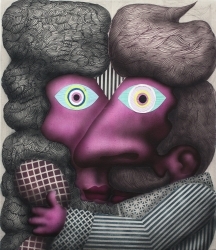 We're pleased to announce the representation of the Spanish artist José Lerma. 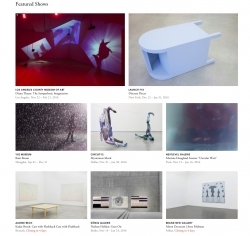 The exhibition by Amy Feldman is included in the "featured shows" of the week on ARTSY. 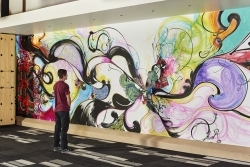 Ryan Conrad Sawyer in the group exhibition Condensed Matter Community at Synchrotron Radiation Center, Stoughton, WI. 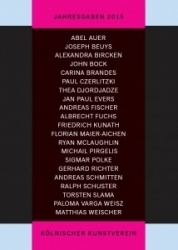 Others artists: Cory Arcangel, Tauba Auerbach, Sascha Braunig, Michelle Grabner, José Lerma, Scott Reeder, Daniel Turner, etc. 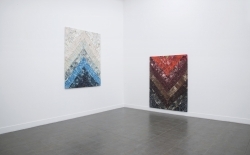 Ryan Conrad Sawyer in the group exhibition Artists' Voices at Centre d'édition Contemporaine Genève. 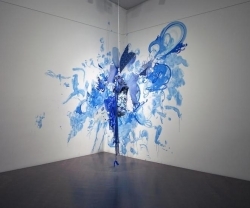 Shinique Smith's performance Gesture II: Between Two Breaths is featured on Artspace. 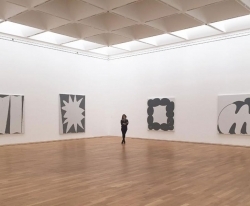 We're pleased to announce that the gallery has been included in the article "40 European Art Galleries You Need to Know" on Mylo magazine. 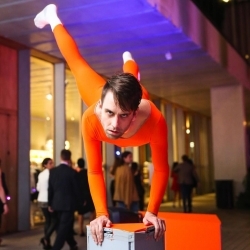 Ryan McNamara's performance Dimensions at Perez Museum in Miami is featured on Artnet. 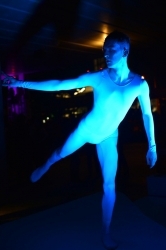 Ryan McNamara new performance Dimensions at Perez Museum in Miami on view the 3th December 2015. 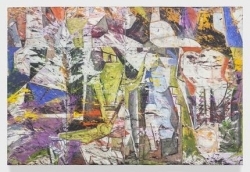 Paul Czerlitzki in the group exhibition Jahresgaben 2015 at Koelnischer Kunstverein, Cologne, DE. Others artists:Joseph Beuys, John Bock, Thea Djordjadze, Friedrich Kunath, Florian Maier-Aichen, Singmar Polke, Gehrard Richter, Matthias Weischer, etc. 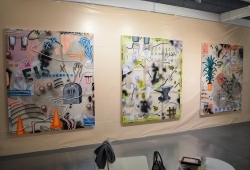 Shinique Smith in the group exhibition NO MAN'S LAND, Women Artists from the Rubell Family Collection at Rubell Family Collection, Miami, FL. 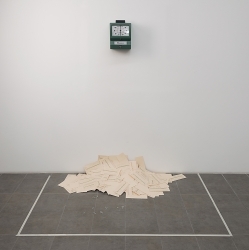 Amy Feldman & Pascual Sisto exhibitions at our gallery are reviewed on Aujourd'hui magazine. Ryan McNamara's performance Dimensions at Perez Museum in Miami is featured on The New York Times. An interview to Ryan McNamara about his performance Dimensions at Perez Museum in Miami is featured on Interview magazine. Shinique Smith's mural commission at Aspen Art Museum at Elk Camp, CO.
Our current shows by Amy Feldman & Pascual Sisto are featured on A Raw Tip. 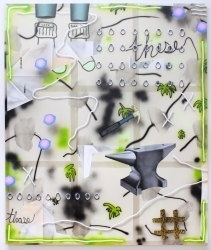 A review of our current shows by Amy Feldman & Pascual Sisto is featured on Artibune. 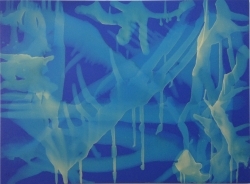 A video interview to John Knuth is featured on Absolut Art. 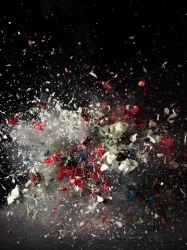 Ori Gersht in the group exhibition Revelations: Experiments in Photography at National Media Museum, Bradford, UK. Graham Wilson is featured in the article "ARCO Unveils 2016 Plans for Madrid, Expansion in Portugal" on Blouin Artinfo. 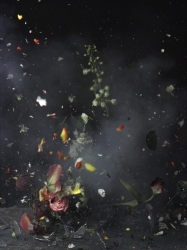 Ori Gersht in the group exhibition Disorder: Finalist's Exhibition Prix Pictet at Musée d'Art Moderne de la Ville de Paris, Paris, FR. 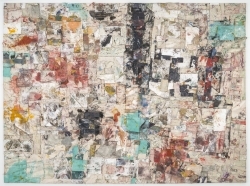 Joe Reihsen in the group exhibition Salón de arte contemporáneo 2015, Lima, Peru'. 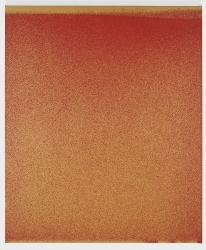 Others artists: Francisc Alys, Miroslaw Balka, Robert Janitz, Zoe Leonard, Donald Judd, Ellsworth Kelly, Sol Le Witt, Robert Mangold, Bruce Nauman, Robert Rauschenberg, Thomas Ruff, Doris Salcedo, etc. 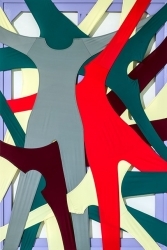 We're pleased to announce that the Shinique Smith's work Splendid was acquired by the Museum of Fine Arts Boston, Boston, MA. 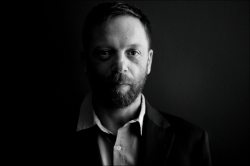 Ryan Conrad Sawyer is featured on Kooness magazine. 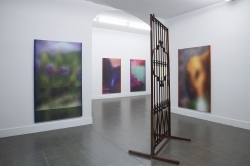 Ryan McNamara is featured in the article "FIAC Paris Art Week Photo Report" on My Art Guides. 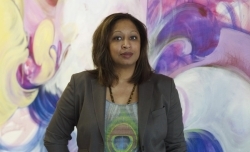 Shinique is featured on Nashville Scene about her solo exhibition Shinique Smith: Wonder Rainbows at The Frisk Center for the Visual Arts, Nashville, TN. 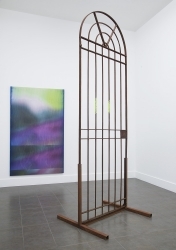 Josh Reames is featured on this article "What Did I (Not) Miss: FIAC, OFFICIELLE & Paris Internationale 2015" on Bpigs. We're pleased to announce that the Angel Otero's work A rustling in the leaves drives him away was acquired by the Istanbul Modern museum, Istanbul, TR. 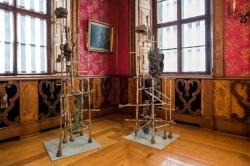 Josh Reames is featured in the article "Susan and Michael's Hort's Must See Works from FIAC 2015" on Artspace. Two person show by Letha Wilson & Richard T. Walker at Capital, San Francisco, CA. 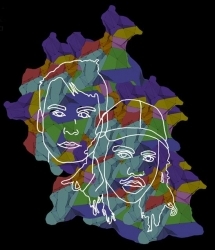 Graham Wilson and Ry David Bradley's solo exhibitions are featured on Mousse magazine. Shinique Smith in the group exhibition 30 Americans (organized by The Rubell Family Collection) at Detroit Institute of Arts, Detroit, MI. 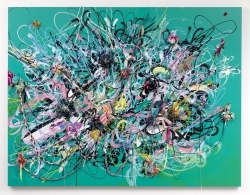 Others artists: Jean-Michel Basquait, Mark Bradford, David Hammons, Rashid Johnson, Glenn Ligon, Kerry James Marshall, Wangechi Mutu, Henry Taylor, Mickalene Thomas, Kara Walker, Kehinde Wiley, etc. 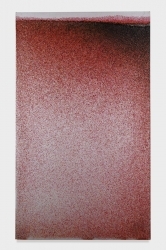 Graham Wilson's solo exhibition at our gallery is featured on A Raw Tip. Ry David Bradley's solo exhibition at our gallery is featured on 2-TIMES Magazine. 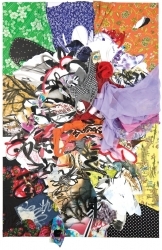 Alain Biltereyst is featured in an article "How to Start Colletting Art" by Ivanka Trump. 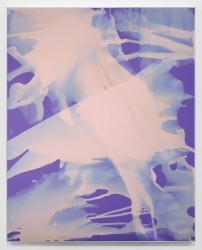 Josh Reames is featured in the article "15 Young Artists To Watch Now" on Goop magazine. 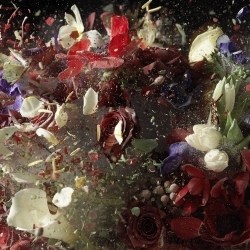 Ori Gersht in the group exhibition Performance and Remnant at The Fine Art Society, London, UK. Solo exhibition Shinique Smith: Wonder Rainbows at The Frisk Center for the Visual Arts, Nashville, TN. Ori Gersht in the group exhibition WhatsAppropiation - A arte de revisitar a arte at Fundição Progresso, Rio de Janeiro, BR. 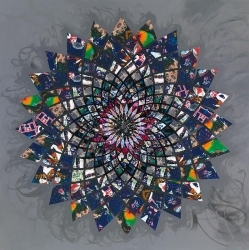 Other artists: Vik Muniz, Martha Rosler, Bill Viola, etc. 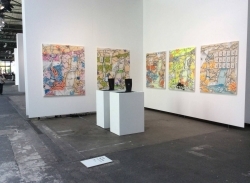 Our booth by Alain Biltereyst & Joe Reihsen at ARTBO 2015 is featured in the article "ARTBO Fosters a New Collector Base in Colombia in 11th Edition" by Katy Diamond Hamer on ARTSY. Kate Steciw & Letha Wilson in conversation with the curator Charlotte Cotton at The New School Theresa Lang Student and Community Center, New York, NY. Shinique Smith's performance Gesture II: Between Two Breaths at BAM in occasion of the 14th season of Next Wave Art, Brooklyn, NY. Ori Gersht solo exhibition Reflecting History, Govert Flinck & Ori Gersht at Museum Kurhaus Kleve, Kleve, DE. Ryan McNamara's progect MOVE! Pose in collaboration with Diane Von Furstenberg. 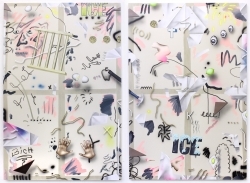 We're pleased to announce the representation of the American artist Kate Steciw. 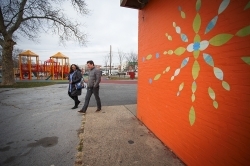 Shinique Smith in the citywide exhibition OPEN SOURCE commissioned by City of Philadelphia Mural Art Projects, Philadelphia, PA.
Joe Reihsen & Alain Biltereyst booth at ARTBO 2015 featured on A Raw Tip. 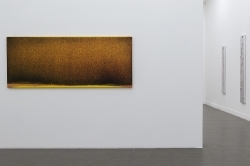 Graham Wilson's solo exhibition at our gallery is featured on Aujourd'hui magazine. 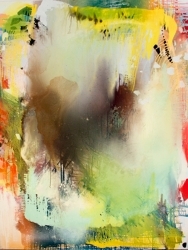 Ry David Bradley is featured on Painting Diary. 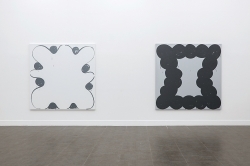 Graham Wilson's solo exhibition at our gallery is featured on WIDEWALLS magazine. 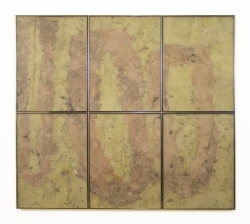 John Knuth in the group exhibition Improper Nouns at Blackbridge Offspace, Beijing. 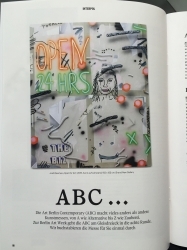 Josh Reames is featured in the article "Greeting from ABC Berlin" on Fisk Frisk Magazine. 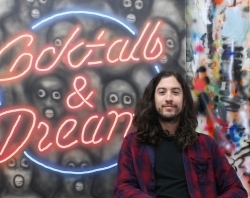 Graham Wilson is featured in the article "Graham Wilson: From Art Handler to Artist to Watch" on Blouin Artinfo. 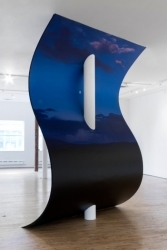 John Knuth in the group exhibition Splitting Light at UB Art Gallery, University at Buffalo, Buffalo, NY. 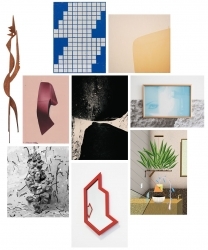 Other artists: Anna Betbeze, Sam Falls, David Benjamin Sherry, etc. 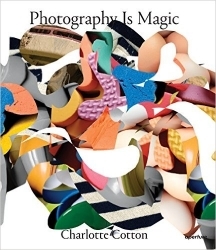 Kate Steciw on the cover of the book "Photography is Magic" where his work is also featured. An article about Graham Wilson is featured on the September issue of the magazine Modern Painters. 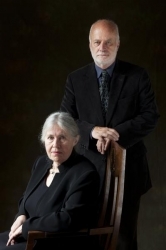 An interview to John Knuth is featured on MAKE Magazine. 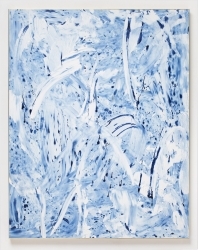 Josh Reames is featured on Painting Diary. 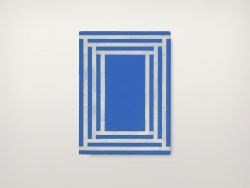 Josh Reames' solo booth at ABC Art Berlin Contemporary on ARTUPDATE. Folkert de Jong e Anton Henning in the group exhibition After Picasso: 80 Contemporary Artists at Wexner Center for the Arts, Columbus, OH. Other artists: Walead Beshty, Anton Henning, Jasper Johns, Martin Kippenberger, Maria Lassnig, Louise Lawler, Marlene Dumas, Roy Lichtenstein, Andy Warhol, etc. 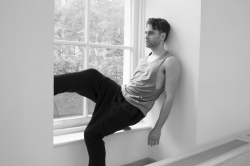 Josh Reames is featured in the article "ABC..." on Monopol Magazine, September issue. 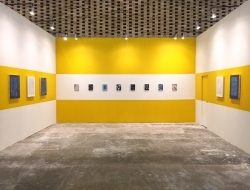 Josh Reames' solo booth at ABC Art Berlin Contemporary 2015. 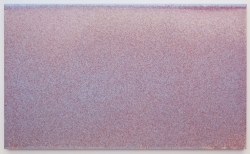 We're pleased to announce that the Australian artist Ry David Bradley has joined the gallery. 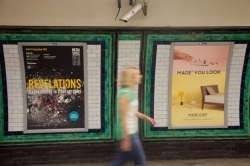 Ori Gersht's work is used like image for the billboards of the show Revelations: Experiments in Photography at Science Museum in London. 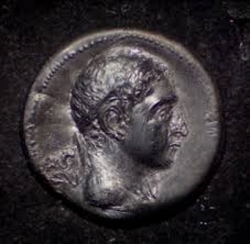 An article about John Knuth is featured on Coeval Magazine. 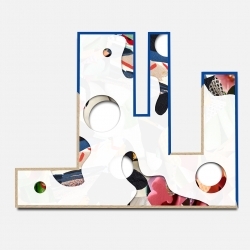 Josh Reames is featured in the article "7 Booths to Watch at abc Berlin" on Elephant magazine. 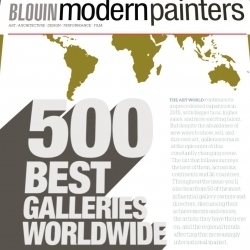 We're pleased to announce that the gallery has been included for the second time in the list of the "500 Best Galleries Worldwide" on Modern Painters. 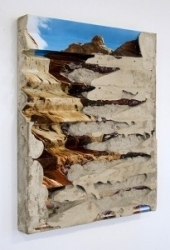 Josh Knuth in the pop up project Temporary Contemporary Malibu, Malibu, CA. Presentation of the new video Gesture III: One Great Turning by Shinique Smith commissioned by The Rose Kennedy Greeway Conservancy. 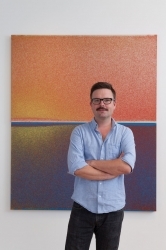 Josh Reames is featured in the article "10 Emerging Artists You Really Need To Know Showing at Art Berlin Contemporary 2015" on Artnet. 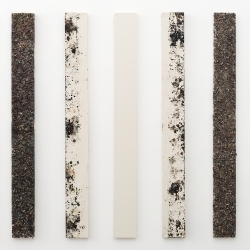 Ry David Bradley's solo exhibition at our gallery is included in the article "50 Must-See Fall Exhibitions" on Artsy. 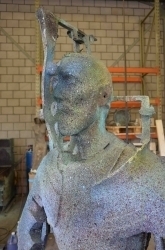 Folkert de Jong in the group exhibition Lustwarande 15: Rapture and PainDe Oude on the occasion of the 5th Edition International Sculpture Exhibition at Park De Oude Warande, Tilburg, NL. 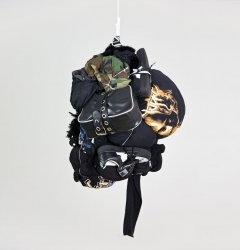 Other artists: Atelier van Lieshout, Tom Burr, Roger Hiorns, Ugo Rondinone, Daniel Roth, Eva Rothschild, etc. 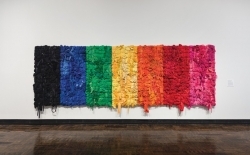 Graham Wilson is included in The Wall Street Journal's article "The Art World's New Material Obsession: Fiber", about the revival of fiber-based work in contemporary art. 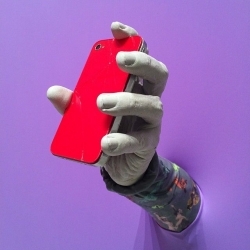 Kasper Sonne is included in the article "E-appreciation thru Instagram" on Financial Times. 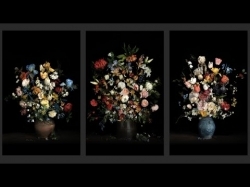 Ori Gersht in the group exhibition Still Life: Capturing the Moment at Palm Springs Art Museum, Palm Springs, CA. 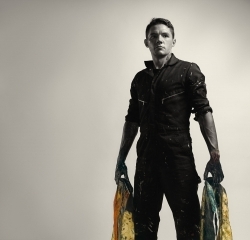 An interview to Ry David Bradley is featured on Bouin Artinfo. 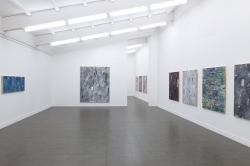 Solo show Midnight in Paris by Anton Henning at Zeppelin Museum, Friedrichshafen, DE. 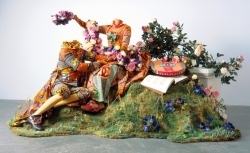 Josh Reames is featured in the article "Figure It Out: The Rise of Figural Non-Objectivity" on Artspace. 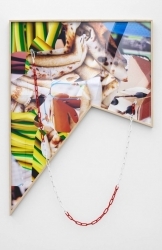 Letha Wilson in the group exhibition U:L:O: Part II: For the Good Times at Interstate Projects, Brooklyn, NY. 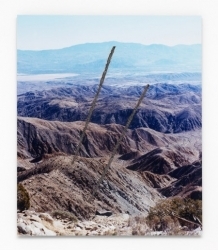 We're pleased to announce that Ori Gersht is shortlisted for the Pirx Picket Photography award. The winner will be announced by Kofi Annan at Musée d’Art Moderne de la Ville de Paris on Thursday 12 November 2015. 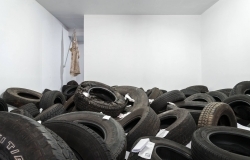 Solo exhibition Tired of Bal(d)ing Out by Graham Wilson at Peninsula Art Space, Brooklyn, NY. 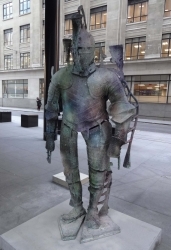 Folkert de Jong in Sculpture in the City 2015, London, UK. 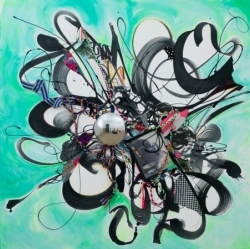 Others artists: Ceal Floyer, Damien Hirst, Kris Martin, Xavier Veilhan, Ai Weiwei, etc. 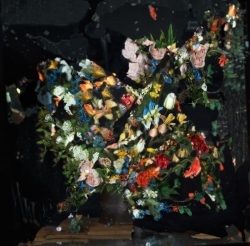 Ori Gersht in the group exhibition STILL LIFE Remix curated by Ilaria Bonacossa at Antinori Art Project, Florence, IT. 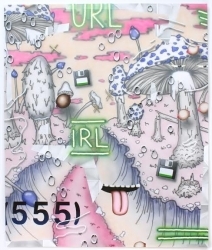 Others artists: Matt Collishaw, Elad Lassry, Nicholas Party, Jack Pierson, Shimabuku, Wolfgang Tillmans, etc. 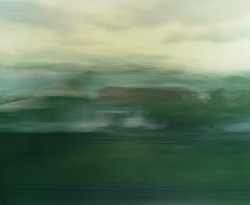 Ori Gersht in the group exhibition This Just In: New Acquisitions at Pizzuti Collection, Columbus, OH. 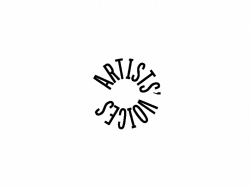 Others artists: Kim Fisher, Alec Soth, Artie Vierkant, etc. 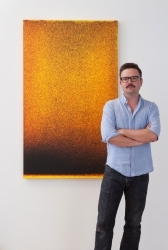 An interview to Josh Reames is featured on Artnet. 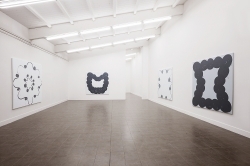 Folkert de Jong in the group exhibition Full House at Kunsthalle Erfurt, DE. 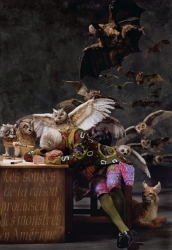 Solo exhibition Yinka Shonibare: Wilderness into a Garden at Daegu Art Museum, Daegu, Corea. 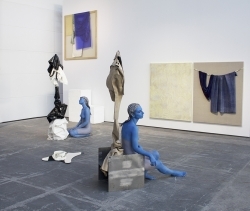 We're pleased to announce that Donna Huanca won the 2015 New York Artadia Award. 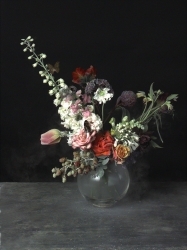 Ori Gersht in the group exhibition Flora at Oriel Davies Gallery, Powys, UK. 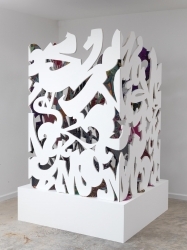 Solo exhibition Egan Frantz - Captive Vocabulary at Fused Space, San Francisco, CA. 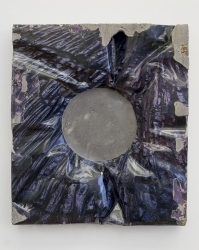 We're pleased to announce that the Letha Wilson's work Rock Hole Punch (Hawaii Lava Black) is now officially part of the Zabludowicz Collection. 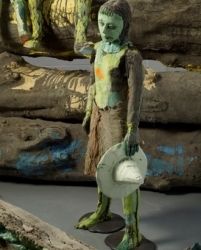 Shinique mith in the group exhibition Showing Off: Recent Modern & Contemporary Acquisitions at Denver Museum of Art, Denver, CO. Other artists: Nick Cave, Eric Fischl, Sol LeWitt, Glenn Ligon, Agnes Martin, Julian Opie, Nam June Paik, Mark Wallinger, etc. 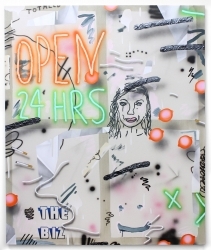 Amy Feldman in the group exhibition New York Painting at Kunstmuseum Bonn, Bonn, DE. 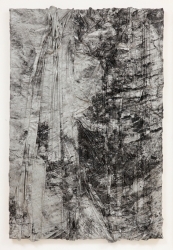 We're pleased to announce that Jackie Saccoccio won the Arcadia NADA Award. Folkert de Jong in the group exhibition Manifesten at Museum Kranenburg, Bergen NH, NL. 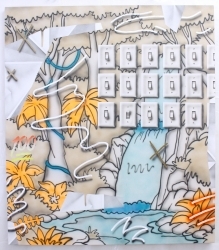 Letha Wilson in the group exhibition River Crossings: Contemporar Art Come Home at Olona State Historic State, Hudson, NY. 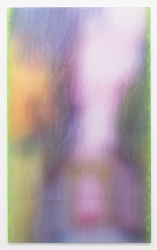 Other artists: Chuck Close, Will Cotton, Charles Ledray, Martin Puryear, Cindy Sherman, Kiki Smith, etc. Solo show Pièce de résistance by Yinka Shonibare CBE at DHC-ART, Montreal, Canada. 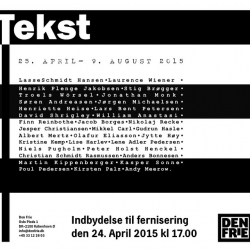 Kasper Sonne in the group exhibition Tekst at Den Frie, Copenhagen, DK. 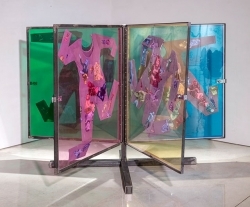 Shinique Smith in the group exhibition Women and Abstraction at Cornell Fine Arts Museum, Rollins College, Winter Park, FL. 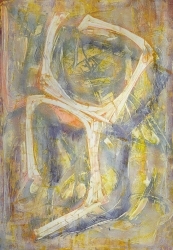 Other artists: Helen Frankenthaler, Carmen Herrera, Lee Krasner, Sarah Morris, Georgia O'Keefee, etc. 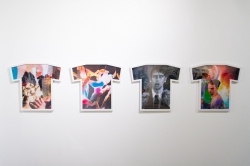 A review of the show by Ryan McNamara at Mary Boone Gallery is featured on Art in America. Shinique Smith in the group exhibition 30 Americans (organized by The Rubell Family Collection) at The Arkansas Art Center, Little Rock, AZ. 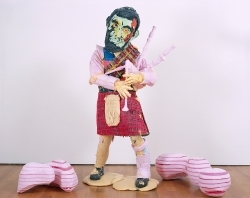 Others artists: Jean-Michel Basquait, Mark Bradford, David Hammons, Rashid Johnson, Glenn Ligon, Kerry James Marshall, Wangechi Mutu, Henry Taylor, Mickalene Thomas, Kara Walker, Kehinde Wiley, etc. 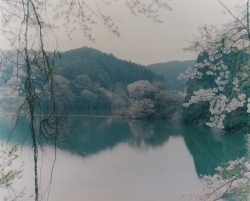 Ori Gersht in the group exhibition Director's Cut: Recent Photography Gifts to the NCMA at The North Carolina Museum of Art, Raleigh, NC. 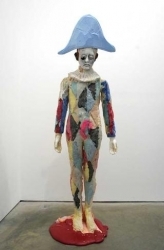 Folkert de Jong in the group exhibition Picasso in Contemporary Art at Deichtorhallen Hamburg, DE. Others artists: Georg Baselitz, Sophie Calle, Marlene Dumas, Jasper Johns, Martin Kippenberger, Roy Lichtenstein, Robert Longo, Claes Oldenburg, Andy Warhol, etc. 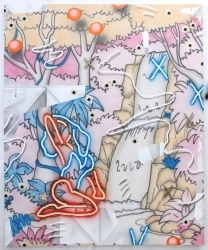 We're pleased to announce the representation of the American artist Graham Wilson. 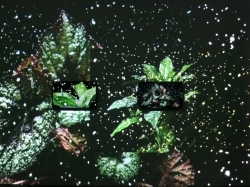 Ori Gersht in the group exhibition Revelations: Experiments in Photography at Science Museum, London, UK. 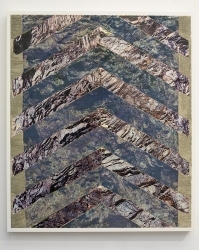 Solo exhibition Sight Specific by Letha Wilson at Light Work, Syracuse, NY. 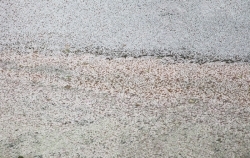 Solo exhibition Forces of Nature: Video and Photographic Works by Ori Gersht at Museum Sinclair Haus, Bad Homburg, DE. 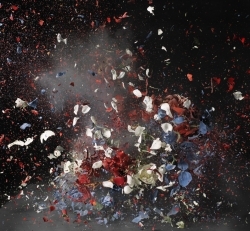 Ori Gersht in the group exhibition Disrupted Spaces: Photographs from the Carey Schwartz Collection, The Rose Art Museum at Brandeis University, Waltham, MA. 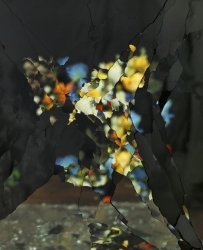 Letha Wilson in the group exhibition An Unfixed Image: The Photographic Accross Media at The College of New Jersey Art Gallery, Ewing, NJ. 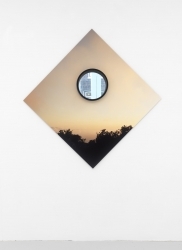 Other artists: Elad Lassry, Marlo Pascual, Eileen Quinlan, Mariah Robertson, John Stezaker, Sara VanDerBeek, etc. 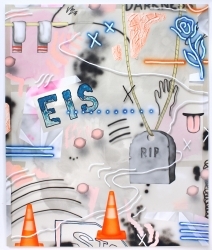 We're pleased to announce that the American artist Josh Reames has joined the gallery. 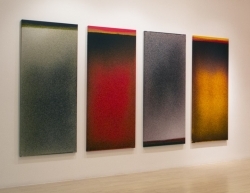 Solo exhibition Desert Dispersion by John Knuth at the Armory Center for the Arts, Pasadena, CA. 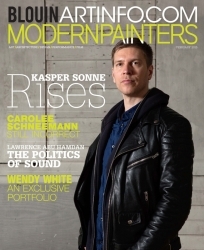 The cover of the magazine Modern Painters February issue, is dedicated to Kasper Sonne. 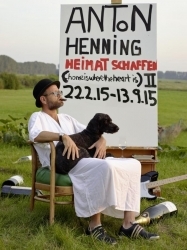 Solo show Heimat schaffen - home is where the heart is (II) by Anton Henning at Museum Neuruppin, Neuruppin, DE. 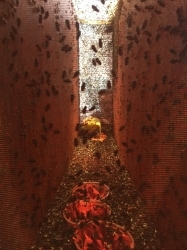 Solo exhibition Threaded by Shinique Smith at Center for the Arts in Virginia at Virginia Tech. Jackie Saccoccio in the group exhibition Pretty Raw: After and Around Helen Frankenthaler at The Rose Art Museum at Brandeis University, Waltham, MA. 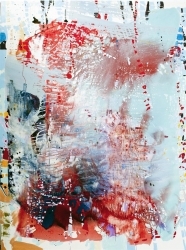 Others artists: Mark Barrow, Mark Bradford, Helen Frankenthaler, Jacqueline Humphries, Mike Kelley, Morris Louis, Marilyn Minter, Laura Owens, Sterling Ruby, Wolfgang Tillmans, Kara Walker, Andy Warhol, Mary Weatherford, Christopher Wool, etc. Solo show Ori Gersht, Don't Look Back at Towner Art Gallery, Eastbourne, UK. Angel Otero in the group exhibition Piece by Piece: Building a Collection at the Kemper Museum of Contemporary Art, Kansas City, MO. 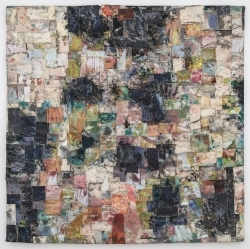 Others artists: Sanford Biggers, Sara Braman, Teresita Fernandez, Theaster Gates, Michelle Grabner, Vik Muniz, Mickalene Thomas, Kara Walker, etc. 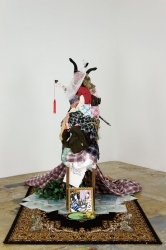 Folkert de Jong in the group exhibition Beautiful Beast at the New York Academy of Art, New York, NY. Letha Wilson in the group exhibition Picture/Thing at Center for the Arts at Wesleyan University, Middletown, CT.
John Knuth in the group exhibition Color Fields at MassArt-Massachussets College of Art and Design, Boston, MA. 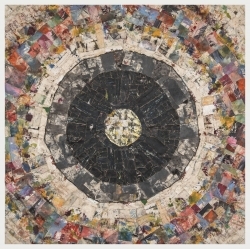 Others artists: Terry Adkins, Michelle Grabner, Channa Horwitz, Jim Lambie, David Benjamin Sherry, etc. Solo exhibition by Kasper Sonne at The Arts Club, London. An article about Ryan McNamara is featured on W Magazine. 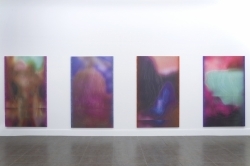 Gabriel Hartley in the group exhibition At the Point of Gesture curated by David Ryan at Wimbledon Space, Wimbledon College of Art, London, UK. 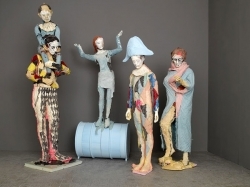 Folkert de Jong in the group exhibition In Search of Meaning - The Human Image in a Global Perspective at Museum de Fundatie, Zwolle, NE. 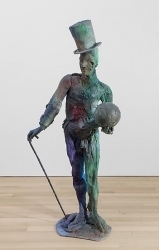 Others artists: Stephan Balkenhol, Berlinde de Bruyckere, Jan Fabre, Antony Gormley, Juan Munoz, Marc Quinn, Yinka Shonibare MBE, Kiki Smith, etc. 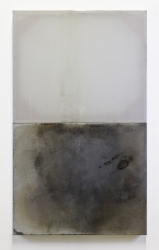 An article about Ryan McNamara is featured on ARTNEWS. 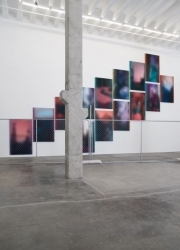 Ori Gersht in the group exhibition In __ We Trust: Art and Money at the Columbus Museum of Art, Columbus, OH. 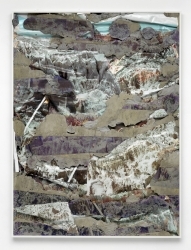 Others artists: Moyra Davey Claire Fontaine, Tom Friedman, Ryan Gander, Roger Hiorns, Gabriel Kuri, Cildo Meireles, Hugh Scott-Douglas, Nari Ward, Andy Warhol, etc.